Eats n Feats: Road Food Again! We met some people in Glacier who we knew were going to be here in Yellowstone when we arrived. We looked them up and they suggested having dinner tonight at an interesting steak house they had discovered some years past on a previous trip. It was certainly "interesting"! You order at the counter when you walk in and you are presented with your uncooked steak and told to go to the back of the restaurant and cook it yourself. Quite a novel approach and actually a lot of fun. We split the above steak and ordered an extra salad (it comes with a really good salad and bread). 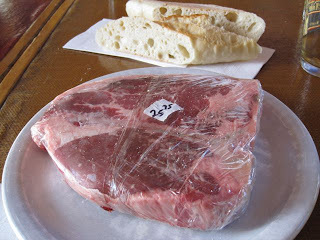 You go to the grill area, season your steak and grill it and your bread if you want. 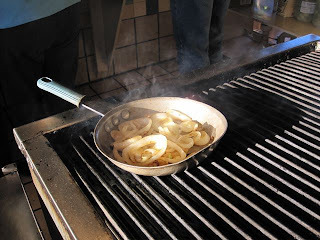 You can also saute your own onions. Man, that was a good steak. 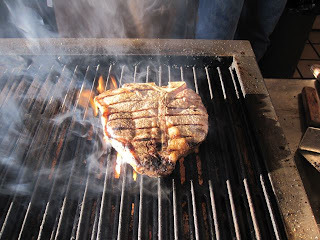 JC cooked it a little too rare at first, so he just went back to the grill and fine tuned it! 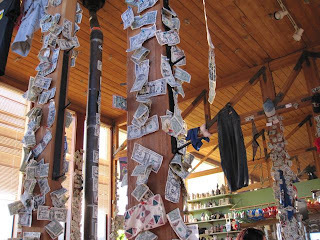 I'm not sure why, but there are dollar bills with messages all over the place - and hats - and t-shirts - and underwear!! 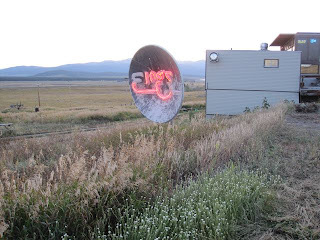 Yes - that is the neon sign in a satellite dish from the dark ages!! Eino's Tavern, 9 miles N of West Yellowstone on US Hwy 191. What a cool concept! I love the sign too. That is awesome...did yall leave anything on the walls? It is kind of cool that you can cook your own meat. Kind of like a Melting Pot then? Is it more like a butcher shop, and you could cook it or take it home? How much did a steak like that cost? Good beer/wine selection? Didn't leave anything on the walls, but we might go back. What should I leave? Definitely not like a Melthing Pot - more like a pretty good dive! !